Anglo-Arabic school team, led by redoubtable defender Md. Rehan struck two goals to rival Sarvodaya Bal Vidyala, Ashok Nagar’s lone goal much to the cheer of big home gathering. City based NGO, One Thousand Hockey Legs, introduced hockey in the football famous school, founded by army chief of Mugal empire in 1650s, five years ago. The school has shown tremendous progress, having won bronze at the Mota Singh Memorial Cup a couple years back, DDA Cup in 2013 and Joe Eziekel Memorial Cup this year. The homes victory is another feather in the crown of the school team. Youngsters like Javed, Ifran, Khursheed led the attack from the front while midfield was superiorly manned by Pervaz Alam, who had already played twice the HI Sub-Junior Nationals. Prashant of SBV, Ashok Vihar, troubled time and again the hosts’ defence but goalie Md Nadeem was in his elements. Prashant however struck once to level the score 1-1, but a disputed penalty corner gave the hosts the winner three minutes before the hooter. 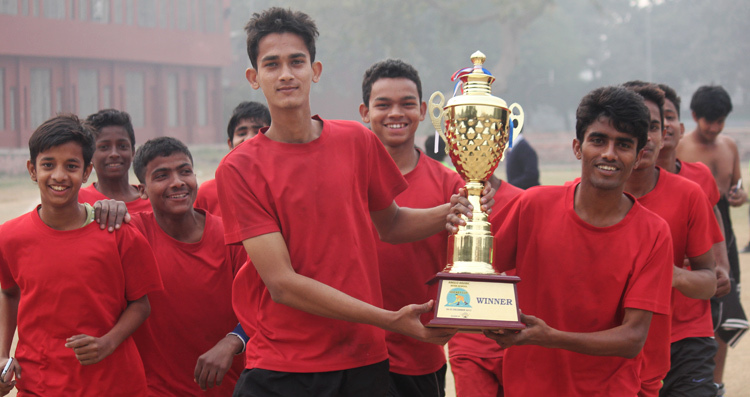 On its way the ultimate winners romped home 8-0 win over Yogi Arvind Sr Sec School, drew GBSSS, Janakpuri 1-1. A single goal margin win over GBSSS Ghittorni enabled the hosts maintain the top position in the pool and thus engage the Ashok Vihar team in the final. Ashok Vihar team, though lost to GBSSS, Mahrauli, managed to beat other teams in the pool to reach the final. The final was witnessed by about 1000 boys of the school. School principal Mr. Waseem gave away the prizes. Abdul Sameer of Anglo-Arabic school, Ajay of GBSSS, Janakpuri and Tinu of runners up team were given away Best Player award. Teams from Saket, MB Road, Manavasthali, Mandir Marg, Chhatarpur, Kesavapuram, Shahpurjat and others took part in the 16-team competition. On the eve of its fifth year of completion in Delhi, One Thousand Hockey Legs created five properties (tournaments) for Delhi. This competition is first of its kind.